Picture the scene : It is twenty four degrees, the sun is shining and there isn't a cloud in the sky. We have a pleasant morning planned with a walk down to the beach. Our buckets and spades are hanging from a bag on the handlebar, and there are towels in the underneath basket of the pushchair. I dress Archie in a light romper, and pop on his sandals. Dylan walks down from his room, his fashion choices in hand - a long sleeved T-shirt, thick lined jeans and socks, and as he reaches the bottom step he reaches for his rocket covered wellies. 'This is what I am going to wear today Mummy'. The boy knows what he wants, and whilst 90% of the time he still lets me choose his clothes, there are days that he is determined to make his own choices and show his individuality to the world. Strangely, this usually involves winter coats and wellington boots, I have even been known to remove a thick bobble hat from his head, much to his dismay - this boy is ready for winter! Realistically, these fashion choices are not appropriate. The wellies and jeans combo means his legs get sweaty, and we end up bringing half the beach home with us. As he made it clear that he wasn't impressed with sandals, we took Dylan shoe shopping, and for the first time let him have complete control over our purchase. Thankfully, there were no new wellies in sight, and after browsing the kids section in Clarks he chose a pair of grey leather shoes with green laces. They were smart, practical and didn't look silly with shorts - everyone wins. The grey shoes now go where Dylan does. He will not wear anything else, and luckily, they seem to go with everything. He reluctanly removes them when we are on the sand, but other than that, they are on his feet. He loves the green laces, and he loves telling everyone we meet about his new shoes. Archie seems happy enough with his new doodles, but he is a barefoot baby at heart. 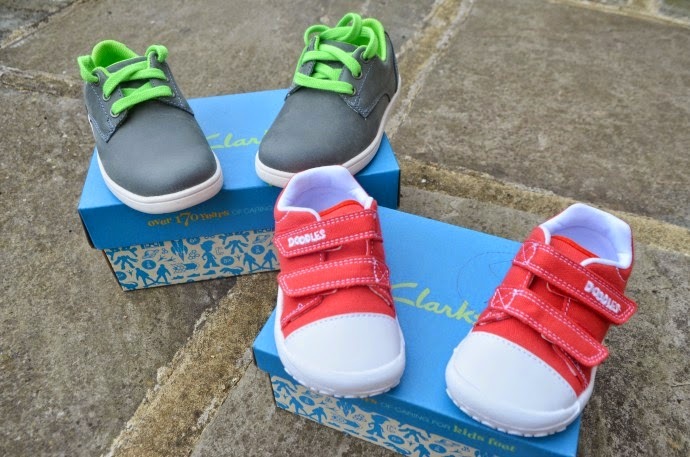 We love the great fit at Clarks, the personal service and the fact they make shoes wide enough for Dylan's chunky toddler feet. 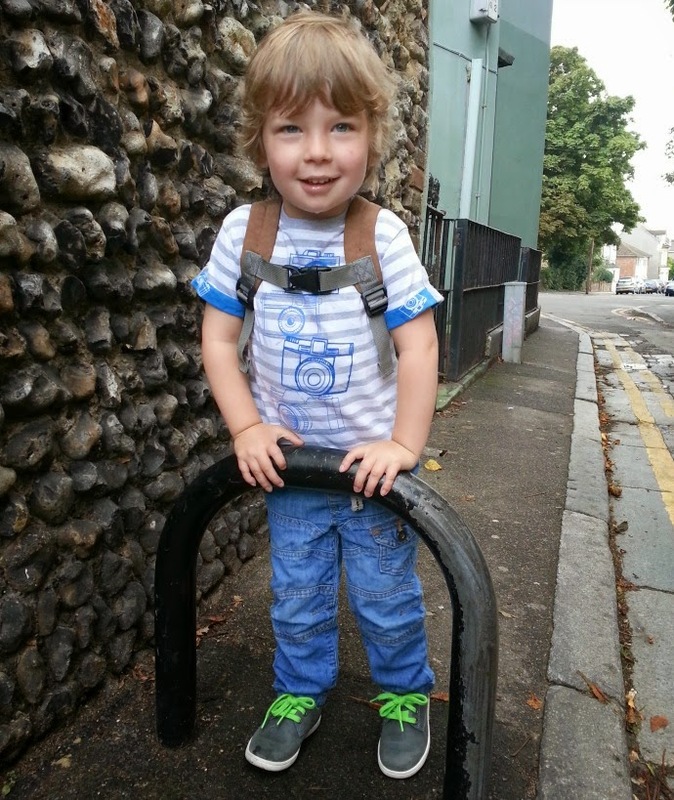 My active boys need shoes that will cope with everything they do, and we find Clarks to be versatile and hard wearing.